Simply connect one end to a well-charged motorcycle battery and the other end to a discharged motorcycle battery. In a brief time, the discharged motorcycle battery is charged using our quick jump start battery recharger. 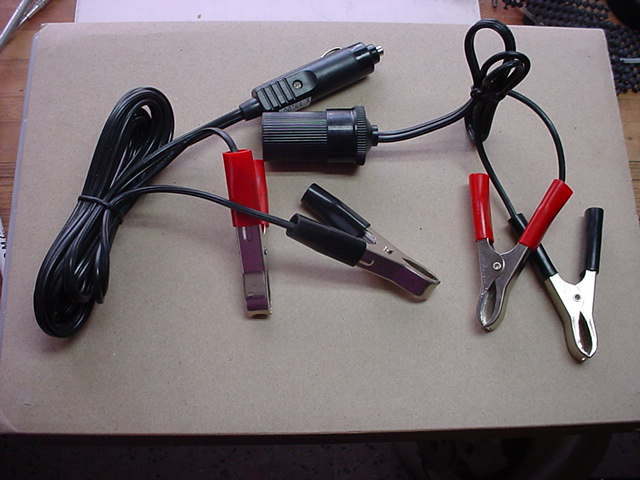 Plug in the cigarette lighter adapter and attach the clips to your motorcycle's battery posts. In no time you'll have your motorcycle maintenanced and your battery recharged. In either configuration, the fuse "monitors" electrical flow for safety when your battery recharger is connected! This motorcycle maintenance tool takes it easy to recruit drivers-easy, fast, convenient, clean battery rechargers with no danger to car or bike. These battery recharger cables are extremely compact weighing 7.1 ounces folding to roughly the size of a palm pilot. Learn how to use our jumper cables and how to replace the 3-amp fuse. The replaceable 3-amp fuse is located inside the cigarette lighter plug on the end of the 8-foot battery recharger cable. To replace a burned out fuse, simply unscrew and remove the end cap and replace the burned out fuse with a new 3-amp fuse. Firmly screw the end cap back in place. For the use of our jumper cables and your motorcycle maintenance, its that easy!